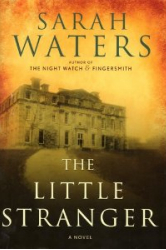 If you enjoy an old-fashioned haunted house story as much as I do, then settle back with Sarah Waters’ chilling fifth novel The Little Stranger. Set in the English countryside in 1947, the story centers on the crumbling mansion Hundreds Hall. I don’t think there’s been a building this creepy and unsettling since Shirley Jackson’s Hill House or Stephen King’s Overlook Hotel. Indeed, Stephen King called The Little Stranger the best book he’d read in 2009. The story’s narrator is Dr. Faraday, a village practitioner who is summoned to Hundreds Hall to treat a 14-year-old servant called Betty. He quickly dismisses her complaints as nothing more than the frustrations of a teenager who would rather work with her friends in a factory. What he can’t dismiss is his strong reaction to Hundreds Hall. Faraday’s mother was a nurserymaid in the manor house back in its glory days and he recalls his occasional childhood visits to the estate. Then as now, he is swept away by its grandeur and beauty. Now a middle-aged bachelor hoping to escape his working class background, Faraday is completely enraptured by the old house and – by extension – its upper class owners. However the Ayres family has fallen on hard times since the war. The widowed Mrs. Ayres still grieves over a young daughter who died decades earlier. Her remaining daughter Caroline is an affable but plain woman whose dreams of an independent life were cut short when she returned home to nurse her dying father. The only son Roderick is a former RAF pilot who emerged from the war wounded in body and spirit. And it’s hard to say what Faraday is more impressed by: the fading glory of Hundreds Hall or the fact that the patrician Ayres family treats him as a social equal. The reader may feel exasperated with the stalwart Faraday who has a ready answer for every disturbing event that occurs. You’d like to shake him sometimes and demand that he take the fears of the Hall’s inhabitants seriously. But even after disaster has struck multiple times, Faraday is as enamored of the house as ever. Neither death nor madness can shake his devotion. Like Henry James’ classic ghost story The Turn of the Screw, Waters’ novel offers up more than one explanation for the dark events that unfold at Hundreds Hall. Could it be the stress brought on by the approach of financial ruin as the estate’s vast properties are sold off to build public housing? Or is there a ghost determined to torment the Ayres family for some past misdeed? There is also an intriguing third possibility put forth by a colleague of Faraday’s, and it is from this theory that the novel’s title is taken. But no matter which theory you choose to believe, the consequences for the Ayres family are genuinely chilling. Don’t look for happy endings or easy answers in The Little Stranger. You won’t find them. What you will find is a suspenseful Gothic tale of an eerie house and the people whose misfortune it is to live in it. At nearly 500 pages, this is not a quick read (although I raced through it.) Action lovers may grow restless at Waters’ slow buildup of tension and dread. But if you revel in masterfully written atmospheric tales, this is the perfect book to pick up on a chilly autumn evening. One last recommendation: keep all the lights on if you read The Little Stranger at night. Otherwise those shadowy corners in the room may start to take on a sinister life of their own. I must start with a disclaimer. I’ve waited years to write this review. Meg Mims is not only a staff writer at LEL, she’s a longtime friend. 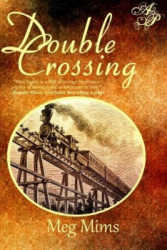 I was as thrilled as she was with the publication of her first novel Double Crossing and couldn’t wait to read – and review - it. But if I had found the book wanting, I would have found an excuse not to review it. Happily that was not the case. Double Crossing is indeed a wonderfully entertaining literary debut. 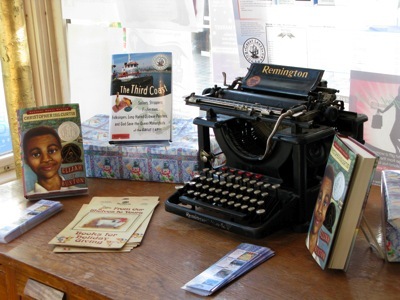 A multi-genre novel, Double Crossing includes mystery, romance, western, and inspirational elements. As a Young Adult book, the recommended readers fall into the 12 to Adult range. But no matter the genre or age group, Double Crossing spins an entertaining and suspenseful tale best described as “True Grit on a Train”. Anyone who has read or seen the True Grit novel or movies knows that it is the story of a teenaged girl in the Old West who is bent on bringing her father’s killer to justice. So too does the heroine of Double Crossing. Nineteen-year old Lily Granville is the only child of Colonel Granville, a wealthy Illinois businessman. Her sheltered and privileged world is shattered one summer night when her father is found shot through the head in his study. While the death is officially ruled a suicide, Lily is convinced that family lawyer Emil Todaro murdered her father. Unfortunately, no one believes that she saw two men flee the house right after the fatal shot was fired. Or that she clearly recognized one of those men as Todaro. Even more suspicious, Todaro is nowhere to be found. It’s not hard to discover the motive. Her father and his brother Harrison own a quicksilver mine in California, but their claim is being disputed. Without the deed, the mine will be taken over by a competitor. Since the safe was found open in her father’s study and Lily has not been able to find the deed, she is convinced that Todaro stole the document and is on his way to California. If justice is to be served, she is the only one who can do it. But she must get to California quickly to warn her uncle about her father’s murderer and the stolen deed. To make matters worse, her Aunt Sylvia turns up at the funeral. Disinherited by the Grandville family when she became an actress, Sylvia enters Lily’s home like a dowager queen with her husband Sir Vaughn Stanhope in tow. Lily takes an instant dislike to the overbearing couple. And her resolve to leave for California is hardened when she overhears the Stanhopes plotting to have her packed off to a hospital while they seize control of her money. Luckily her neighbor (and hopeful suitor) Charles Mason agrees to accompany her to Sacramento, even if that means stealing away in the dead of night. By the time they reach Omaha, Charles and Lily believe all has gone amazingly well. It is the summer of 1869 and they will soon board the new transcontinental railroad for what Lily is sure promises to be an exciting trip. As it turns out, the 2000-mile journey will be thrilling, dangerous and nearly fatal. First the Stanhopes show up unannounced in the Omaha hotel, declaring their intention to also be on the train. Irritated by this turn of events, Lily is further unnerved when her belongings are ransacked. Someone is looking for something, and she suspects that Todaro did not find the deed the night he shot her father. Instead he must believe that she is in possession of it. She wisely decides that Charles, who dreams of being a missionary in China, cannot provide enough protection. So right before the train departs for California she hires a rowdy Texan known as Ace Diamond to act as her bodyguard. I don’t recall a book in recent years that has been largely set on a train. In fact, I might have to reach back for Agatha Christie’s Murder on the Orient Express. No doubt many authors shy away from confining their action to such a small space, but Mims carries it off beautifully. The train journey to California is filled with suspense, humor and an assortment of colorful characters that Christie herself would be proud to claim. And history buffs will enjoy every accurate and fascinating period detail. Clearly Meg Mims has done her research homework for Double Crossing. But don’t imagine that the story ever gets bogged down in historical descriptions. This is a rollicking adventure that never lags from the moment Lily’s father is murdered to the exciting climax in a Sacramento mine. So download Double Crossing, and board the train that Meg Mims has waiting for you. Then sit back and enjoy the ride. Architect Sarah Susanka has spent her professional life designing beautiful residential spaces. During a time when McMansions were springing up in every subdivision, Susanka’s recommendation to “build better, not bigger” resonated with those looking for a more sustainable and harmonious home space. Her 1998 book The Not So Big House introduced her architectural philosophy and quickly became a bestseller. Not surprisingly, she uses architecture as a metaphor for this process. 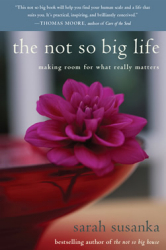 Susanka calls the book a blueprint on how to achieve a smaller, richer life, and includes chapters titled ‘Removing the Clutter’, ‘Proceeding Through the Construction Process’, and ‘Being At Home In Your Life’. Each chapter concludes with a section devoted to exercises that help readers put into practice her recommendations; I found her notebook exercise about the ABCs of meditation especially helpful. And the end of the book contains an 8-page Owners Manual for Your Not So Big Life which Susanka advises reviewing at least once every year. So too is her claim that “nothing happens by accident” which includes the fact that you are reading this review. And if the next step leads you to read the not so big life, it may very well result in a smaller – and happier – life for you.